Casa Cielos Azules was completed in the summer of 2006. It is a large Spanish-style villa perched on a bluff only 150 meters from the Pacific Ocean. Recently two cottages a pool and out door kitchen and bar were added. The house has a second floor master bedroom and bath with a wrap around deck commanding 180 degree view of the Pacific. Two bedrooms on the main floor have their own full baths. The grand room is surrounded by open-air porches enabling outside dining and relaxation. The cottages are part of a pool complex with out door kitchen and bar. In total there are five bedrooms, all with their own bathrooms. Four have queen beds and the master suite has a king bed. Inflatable beds are available for children if desired. Casa Cielos Azules is surrounded by a grand yard in a quiet, undeveloped and unspoiled Pacific beach community. Its relative seclusion guarantees stretches of almost deserted beaches suitable for surfing, body surfing, kayaking, shelling, fishing, sunbathing and long walks. Horseback riding, deep sea and freshwater fishing are available nearby. Longer day trips will allow you breathtaking mountain views and ziplines, rain forests, caving, white water rafting, mountain adventures and thermal spring swimming. There is an assortment of small local restaurant choices nearby offering a variety of dining and entertainment options: from simple open-fired Tico meals to multi-course European feasts. Small convenience stores in Junquillal and Paraiso can satisfy most needs. Complete grocery stores in Santa Cruz--30 minutes away. 'Google Playa Junquillal or Casa Cielos Azules for more information. Sarah and Burt built this house in 2006. It is our second home. In 2017 we added two cottages and a pool complex. 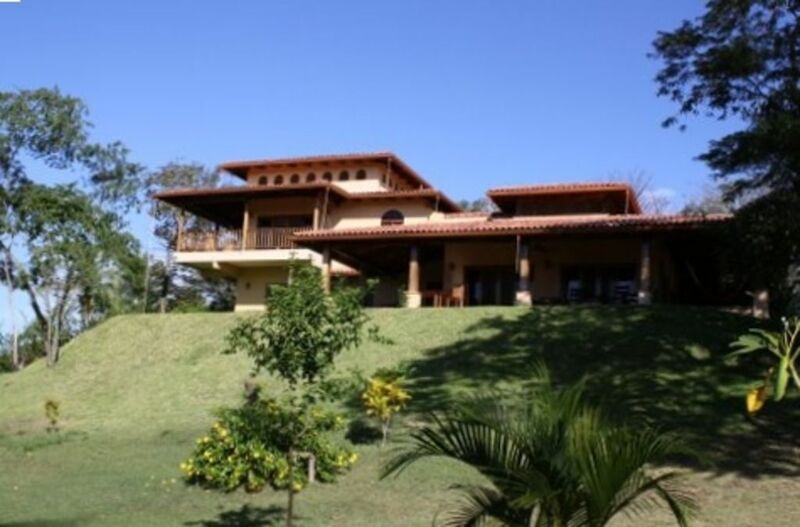 We love the house and Costa Rica. If you rent it I am sure you will too. The beach is magnificent almost deserted and runs for miles. Junquillal is a small sea coast village with a few small hotels and resturants. The Villa has a 270 degree view of the Pacific ocean. Dual fuel, gas and electric--plus outdoor kitchen at the pool complex with stainless Napoleon grill, and burners. Three different areas suitable for dining--At great table in the great room, at tables on the terrace or at tables at the kitchen by the pool. Television is available for use from internet source or a library of videos. Trusted Grumman Canoe is available for use in estuary with magnificent natural setting. Local tennis courts are available for use at any time.. Golf Course is available at Hacienda Pinella that is twenty minutes away. Unbelievably beautiful and amazing location!! My wife and I stayed here for our honeymoon and could not have been happier. The house is huge and beautiful, and we could sit on the upstairs porch for hours on end, listening to the waves crash and enjoying panoramic views of the Pacific. The beach is a 5-10 min walk from your door, and you'll probably be the only people there! Finally, the world's coolest and happiest German Shepherd ("Raúl") will keep you safe and play fetch on the beach! If you're thinking of staying here, do it!! My wife, daughter and I had our dream vacation at this wonderfull property. The house far exceeded our expectations and the setting is spectacular. Private beaches, a great variety of restaurants and the Costa Rica Lifestyle resulted a relaxed fun filled get-away. The house is exquistely designed to take advatage of the sea breezes while provided awesome views and a background of crashing surf. If you are looking for shopping and nightlife you might look elsewhere, but if you want a true Costa Rica vacation this is the place. Thanks for sharing your home. Dan--I am glad you enjoyed it--you appreciate the same things I do. Tennis courts are available nearby, golf course is within 20 minute drive and numerous restaurants of all types are readily available.